Our apples might have the odd knot or gnarl, but they’re grown for old-fashioned flavour. We start the English season with Discovery, a red-skinned fruit with crisp white flesh. Then come flavoursome Red Windsor and Red Pippin. Mid-season is for aromatic, dark-skinned Spartan and deliciously tangy Crimson Crisp. Once the homegrown season is over, we source different varieties overseas: Gala, Red Delicious, Autumn Greeting. 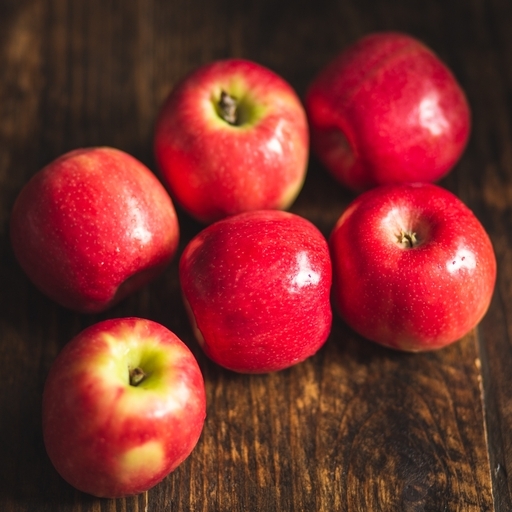 This week’s apples are Crimson Crisp. Will keep for around a week at room temperature. Delivered fresh from the farm, so wash before eating. Our apples are sold as class 2. This means that they might not look cosmetically perfect, but they are grown for the very best flavour. (We have to tell you this to satisfy some EU rules).